I always think its 'odd' when I stumble on stories without meaning to - and I did just that with Mike Tyson who has just been in the news admitting that he has been 'clean' from drink and drugs for just six days. For some reason every now and then I actually do bump into stories of Mike whether on TV as a documentary or a news report and everytime I see him I feel a great deal of empathy. I find it strange that he has that affect to draw a person in but Im not sure whether it is 'he' himself or his aura which has something about it. I felt very sad when I saw the video on this link. I feel there is a lot of good in Mike Tyson - he is a very self expressive person but very deep almost like a bottomless well. I wanted to know if he was going to be ok.
Tarot seemed to suggest that its 'two step forwards and one back' for Mike. In a way I thought, thats not bad because at least its more forward then back? more positive then negative but there are quite a few struggles there for him. See the weighing up of issues to try to get things right and note that this guy in the picture stands right next to the water - liquid elements. Drink might sit on his shoulder but its part of a stormy past that does threaten him and he has to struggle to balance everything up as much as possible. With teamwork things can get a lot better for him so I hope he gets the right people around him to help him and rebuild him and give him or help him with the skills to undo any damage that bad influences with drink etc may have had on his health or physicality. It might take 2 years to really feel fit and well again in the true sense of the word. Many struggles in that so perhaps a possible falling off the wagon or almost 'so' but I hope that his strength of mind can pull him through. 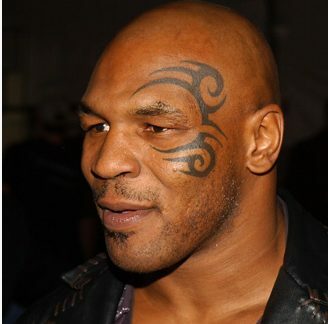 I like Mike Tyson and do not judge his boxing career or his life or what he has done or has not done. The general public are very good at reading stories and deciding things about people. What I see is a human being who is wanting to work things out and I hope that he is able to do that. So this is a brief few words and not really sure why I felt I should write them but I really want this man to succeed in overcoming those problems I see him juggling with there. There may be days when he might feel alone or even rejected, it could be just a state of mind but its a cold place to be especially when there is help right there. He does have to keep asking for it or at least accept it and I hope that he does and gives himself up to healing and feeling well. I would like him to be whatever he wants to be and have the chance to do that. He is the person who leapt out of the news at me today - I wish him well and I wish him strength of purpose and to allow others to help him because they will be there to do this and not to try to face anything alone especially if he finds he needs help with anything. He will then be able to go forward and then look back and see what he has achieved. I would like to see him a happy and healthy businessman in his own right - on top of the world and feeling the world is right with him too. I really do not want to draw any other card - I have no wish to be intrusive other than to ask if he will be ok and with one card I give the briefest outline without digging too deep. Im wishing him good things and much strength I feel that kind hearts should open and push forward some good supportive energy to him. I hope things get better for him but he also needs to carry that positive feeling too. Hopefully this will be the case. So nice to see a report in 2014 about Mike 'winning' the race against problems.